This visit to US has been very exciting till now. 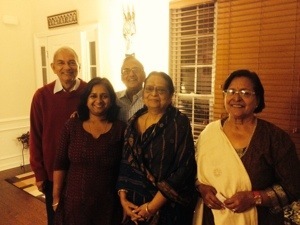 We completed a stay of more than two months with Anand at Cary. We are now in Austin with Rajesh. 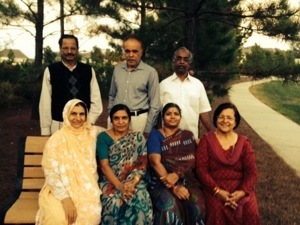 In Cary, we met many parents from India and one couple from Pakistan too. Here below is a group photo. In ‘Harmony’ community, Cary, the number of Indians owning the properties is pretty significant. Families from Andhra Pradesh are in majority. It was pleasant to see even the women from rural Andhra driving big utility vehicles. And it is because of these youngsters that so many parent are visiting US every year which they could not have dreamt otherwise. Interestingly, these Indian young men and women have expertise and engagement in varied professions. I found one young Andhra woman running two pre-school centres. Some are working as doctors. But I was excited to meet the mechanical engineer from Andhra who works in the quality control of John Deere manufacturing facility here. However, the majority of young Indians are in big and small units in IT sector that are in TRP such as CISCO and IBM. I met a family from Kolkata too. I used to meet Balay Chaudhry while going to drop Emma to her elementary school. One evening we visited the house of his daughter, Sukanya and her husband Surya.It was because Balay had invited us.We went for some adda, typical in Bangal and had tea too. Both Sukanya and Surya are from Indian Statistical Institute, Baranagar, Kolkata. Surya teaches in the university and Sukanya works for some consultant firm.